A 65-year-old male with history of metastatic cutaneous melanoma previously on pembrolizuamb presented to the comprehensive ophthalmology service with blurred vision worse in the left eye for the past 6 months. He was initially started on pembrolizumab after an enlarged right hilar lymph node and multiple mediastinal lymph nodes were detected on imaging, which prompted concern for progression after a period of remission of metastatic cutaneous melanoma. A biopsy of the right hilar lymph node confirmed metastatic melanoma. Five months prior to his presentation at UIHC ophthalmology clinic, he reported his eyes became red and light sensitive. At this time he was seen by an outside ophthalmologist and diagnosed with bilateral anterior uveitis for which he was started on prednisolone acetate 1% four times per day (QID) in both eyes. One month later he developed depigmentation on his hands. His oncologist felt this was possibly drug related and discontinued the patient's pembrolizumab. The patient had undergone 7 cycles of pembrolizumab prior to discontinuation of the drug. He was also started on 150 mg of oral prednisone for 6 weeks followed by a slow taper. After starting prednisone his vision and photophobia improved. 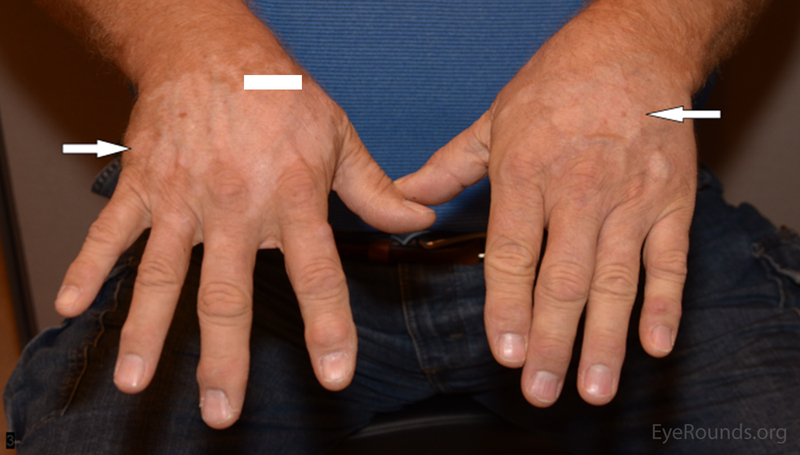 However, upon completion of the prednisone taper, his blurred vision returned along with worsening depigmentation on his hands and face. As per HPI, all other systems reviewed and negative. 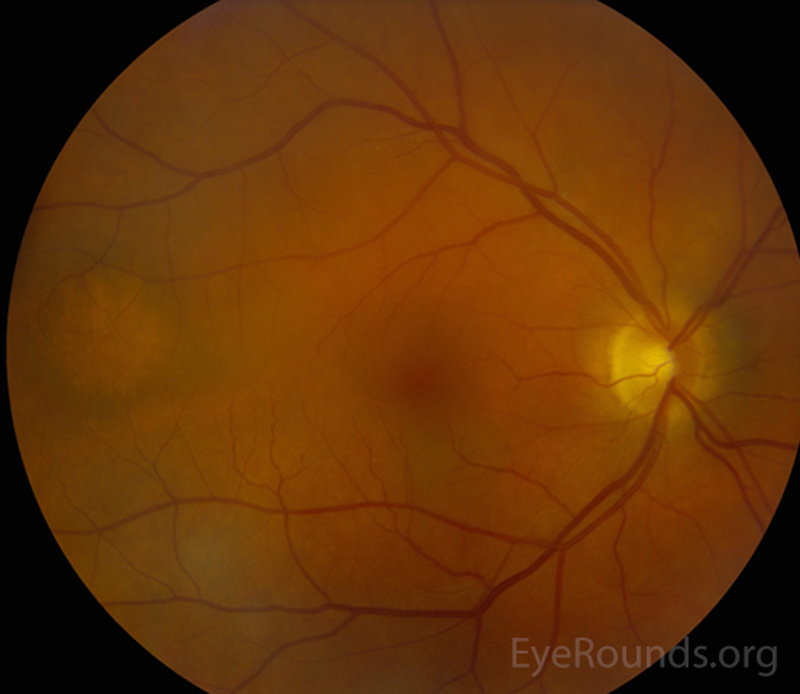 Figure 3: Fundus photos of both eyes. 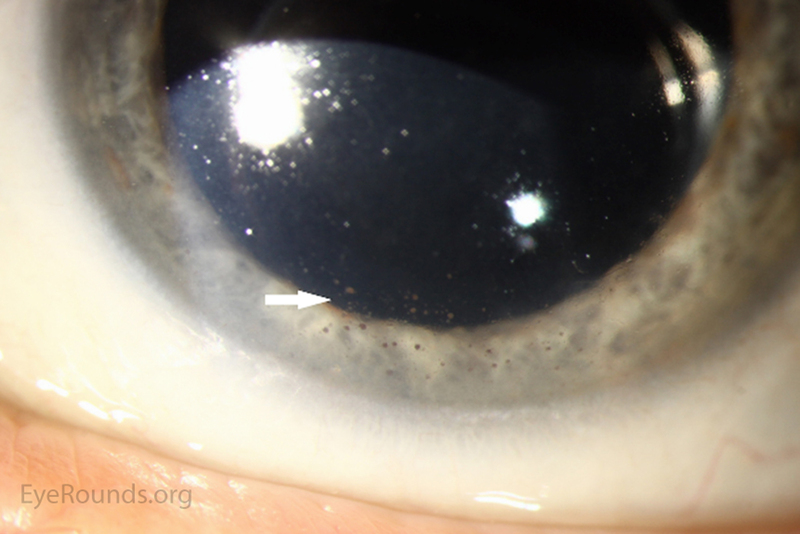 Right eye shows an amelanotic lesion in temporal macula. Left eye was normal. The patient's prednisolone acetate dosage was increased from 4 times per day to hourly OU. He was referred to the retina service for further work-up of the macular lesion in the right eye and for management of panuveitis. Optical coherence tomography (OCT) of the right eye showed a temporal macular choroidal lesion with a 3.6mm horizontal base and <50μm elevation without subretinal fluid. 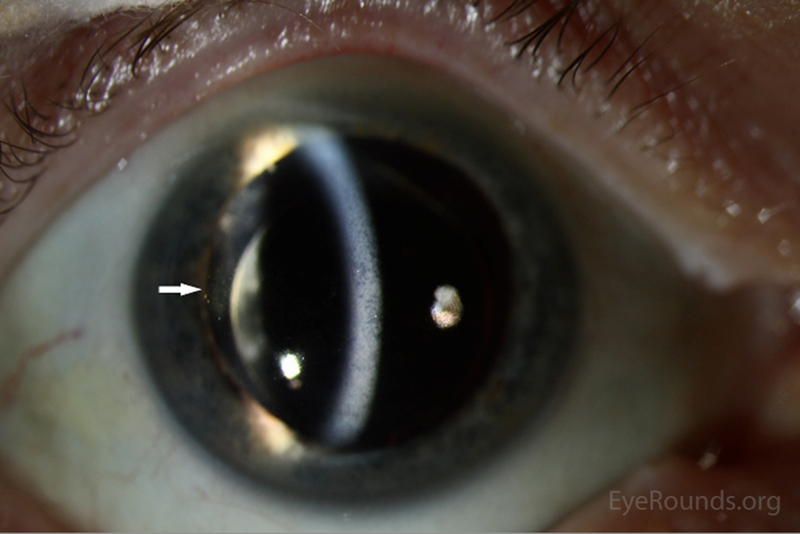 Echography of the right eye demonstrated a high reflective lesion elevated <1mm in size. At his 2-week follow-up appointment, the patient showed improvement in visual acuity and a decrease in anterior chamber inflammation. He was continued on hourly prednisolone acetate OU and the plan was for close observation with continued monitoring of the choroidal lesion in the right eye. The patient followed-up with the retina clinic again 2 weeks later and reported no improvement in his vision. However, his ocular exam showed resolution of keratitic precipitates and the anterior chamber was quiet without cell or flare. 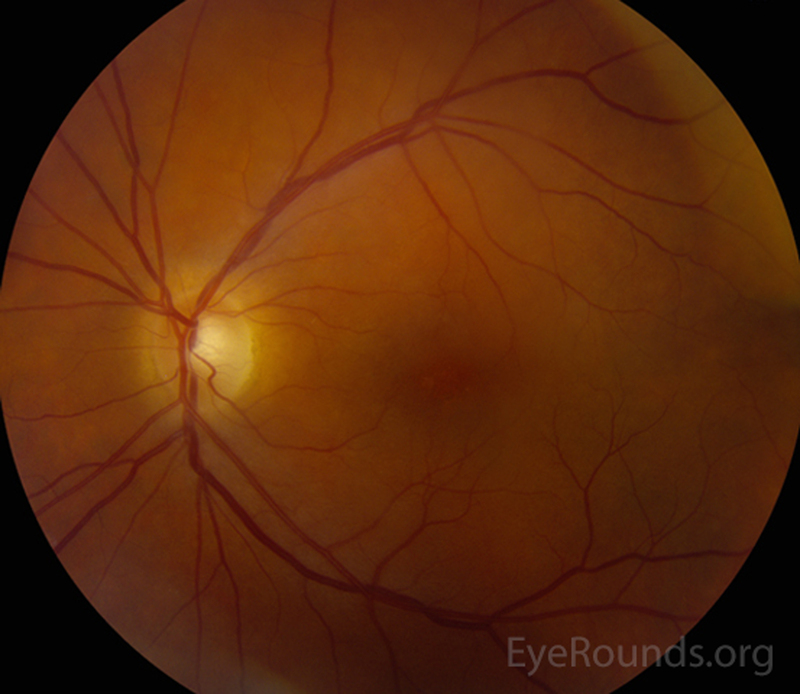 Electroretinography was normal OU which ruled out melanoma associated retinopathy. The prednisolone acetate frequency was decreased to every 2 hours OU. The patient continued to follow with his oncologist for management of his cutaneous melanoma and there was no evidence of additional metastasis on routine imaging of the patient's head, neck, chest, and abdomen. The lymph nodes in his lungs responded to pembrolizumab although the patient's regimen of pembrolizumab was shortened by his body's negative inflammatory response to the drug. At his 2-month follow-up in the retina clinic, he reported improvement in his vision. Pembrolizumab is a monoclonal antibody used to treat metastatic melanoma. It which binds and blocks the programmed cell death receptor (PD-1) on T cells (1). PD-1, when activated by binding to programmed cell death receptor ligand (PD-L1), causes down-regulation of cytotoxic T-cell activity that is important in preventing autoimmunity (1). In addition, some cancers, such as malignant melanoma, have increased expression of PD-L1 that aids in immune evasion; however, this may, in turn, increase the risk of autoimmunity (1,2). The most commonly reported autoimmune adverse reactions include hypothyroidism, pneumonitis, and hyperthyroidism (2). These adverse events are considered to be reversible once the drug is stopped and corticosteroids are started (2). In this patient's case, the adverse immune reaction manifested as a combination of vitiligo-like skin changes and bilateral uveitis. As has been reported in similar cases, his skin manifestations and uveitis improved after the drug was stopped and steroid treatment was established. To date, there have been two previous case reports of pembrolizumab-induced uveitis (3,4). One patient presented with bilateral uveitis and papillitis after two months of treatment. This patient's symptoms resolved upon stopping the drug and starting topical steroids. The second case report had a similar presentation and the uveitis improved with a topical and oral steroid course. This patient did develop visually-significant posterior subcapsular cataracts requiring surgical intervention. We hypothesize that the activated cytotoxic T cells in these patients recognize epitopes in the uveal melanocytes (as well as the dermal melanocytes in this patient) that are similar to the epitopes in the melanoma spindle cells which, in turn, leads to uveitis and the vitiligo-like skin changes in our patient. In conclusion, patients being treated with pembrolizumab who experience visual changes should be evaluated by an ophthalmologist for potential drug-induced uveitis. Additional work up to rule out other etiologies based upon patient history could include but is not limited to the following: Syphilis IgG, Lyme titers, quantiferon gold, chest x-ray or CT, CBC, BMP, & urinalysis. Merck Sharp & Dohme Corporation. Keytruda®: Prescribing Information. Kenilworth, NJ: Merck & Co. Inc., 2014. [Accessed on April 25 2017] https://www.merck.com/product/usa/pi_circulars/k/keytruda/keytruda_pi.pdf.